After you park your RV, pitch a tent, or rent a cabin, enjoy the many amenities of Gold Country Campground. Swimming Pool – Take a refreshing plunge in our pool, open in peak season. 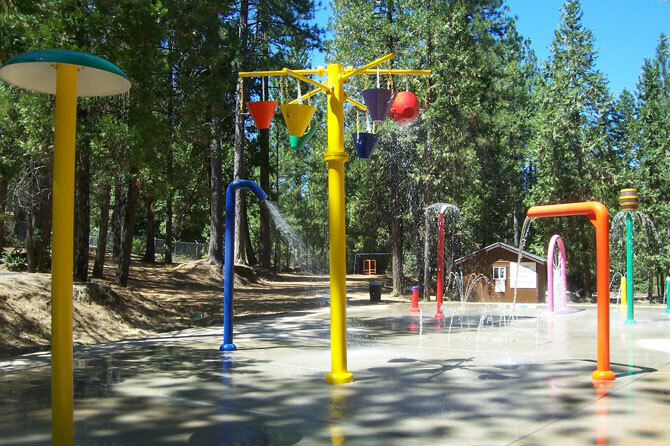 Spray Park – Try the eight different water elements, open in peak season. Dog Park – Remove the dog leash in our fenced yard. Game Room – Play a game of pool, test your skill at electric darts, challenge your friends at ping-pong, or enjoy an arcade game. Horseshoes – Test your skills at horseshoes. Mini Golf – Putt your way through our mini golf course. Playground – Let the youngsters burn off some energy. Clubhouses – Reserve a hall for your upcoming family reunion, RV club outing or party. Store – Get your last minute camping supplies, food, drinks, and gifts at our convenient on-site store. Laundry Facilities – Onsite coin-operated laundry washers and dryers. Restrooms / Showers – Conveniently located in the tent and RV camping areas. Dump Station – Free for registered guests while staying at Gold Country Campground. There is a $25 fee for dump use only. Free, State of the Art WiFi – We also offer premium wifi for HD streaming and gaming, see special details by clicking here. Avoid running into town by shopping at our store for snacks, ice, firewood and snack bar!